The Hopewell Rocks, also called the Flowerpots Rocks or simply The Rocks, are rock formations caused by tidal erosion in The Hopewell Rocks Ocean Tidal Exploration Site in New Brunswick. They stand 40–70 feet tall. The formations consist of dark sedimentary conglomerate and sandstone rock. 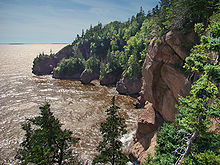 The large volume of water flowing in to and out of the Bay of Fundy modifies the landscape surrounding it. After the retreat of the glaciers in the region following the last ice age, surface water filtering through cracks in the cliff has eroded and separated the formations from the rest of the cliff face. Meanwhile, advancing and retreating tides and the associated waves have eroded the base of the rocks at a faster rate than the tops, resulting in their unusual shapes. The vast sediment planes in the basin in Fundy supports a variety of biological productivity. Various shorebirds are often seen flocking to nest and feed in the area. Visitors are advised to stay for a full tidal cycle to get a full appreciation of the tides and formations. Although the tides vary from day to day, the high tide can be as high as 16 metres (52 ft) giving the Hopewell Rocks one of the highest average tides in the world. On March 14, 2016, a part of one of the Hopewell Rocks, Elephant Rock, collapsed. Park officials said approximately 100 to 200 tonnes of rock fell to the ground. "Sometime after the tide went out this morning, a significant piece of Elephant Rock calved off, closing off a whole section or a whole passageway where we used to walk," said Kevin Snair, supervisor of interpretive services at the Hopewell Rocks. 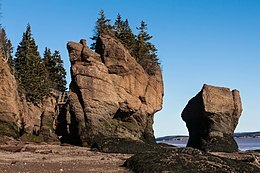 ^ As the rocks are best seen at low tide, check the Hopewell Rocks website for tide tables. ^ "The World's Highest Tides". web page. The official site of the Canadian Tourism Commission. 2009. Retrieved 8 November 2010. 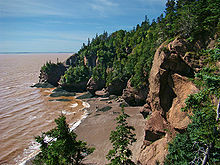 ^ "Elephant Rock at Hopewell Rocks near Bay of Fundy collapses". CBC News. March 14, 2016. Retrieved March 15, 2016. 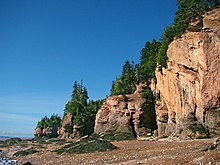 Wikimedia Commons has media related to Hopewell Rocks. This page was last edited on 12 April 2019, at 09:03 (UTC).